Such a strange season for many of our fruit trees with several which have not produced for years suddenly deciding 'this is our year'! 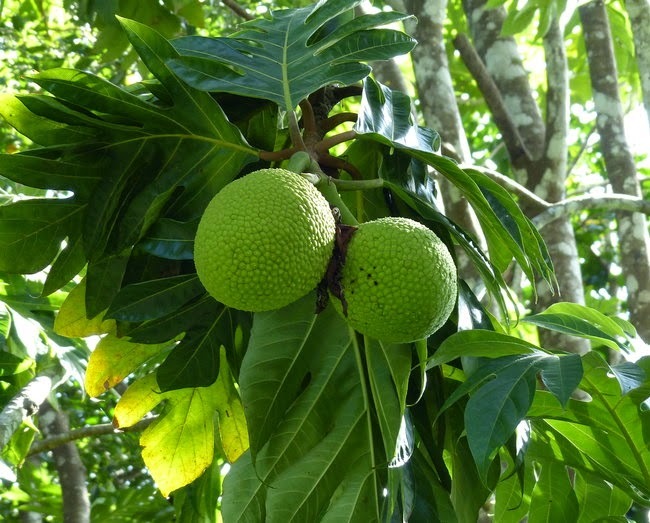 These are Breadfruit on a huge tree near The Shed. White firm flesh, very starchy, but sliced thinly and pan-fried in a little oil they make very nice crisps and cut into chunks can be roasted alongside the Sunday roast. Other trees making a come-back include our one and only Mangosteen, one of our favourite fruits, and one of our several Carambolas (Five-corner, Star-fruit are other names) which hasn't produced for about 10 years.